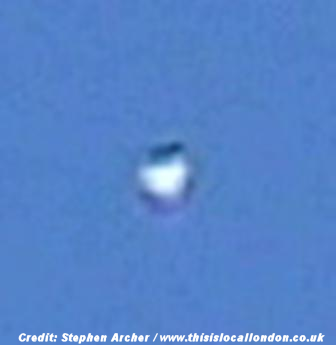 A man has photographed a number of UFOs, spotted in the sky above Welling in the last week. The unidentified objects were first seen by Stephen Archer from his home in Budleigh Crescent at around 6pm last Saturday (May 16). The 40-year-old was about to retire for the evening after a day watching the skies when eight curious objects came into view. He told News Shopper: "I had been out all day sky-watching. I hadn't seen anything for quite a while. "I was about to go indoors when I looked in the sky and there they were. "I observed eight silver spheres sitting stationary in the eastern sky. . . .